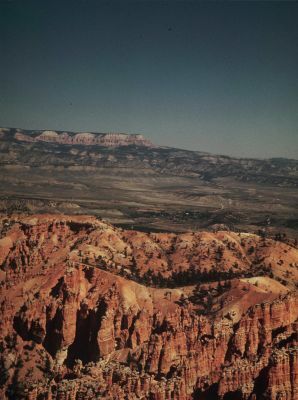 Fifteen miles a away across the Paria River Valley, the Table Cliffs display the same banded rock layers of these at Bryce, but if you could extend the layers across the valley until they met, they wouldn't match: for the Table Cliff Plateau is 2000 feet higher than this one! Earth forces, lifting the plateaus unequally, offset rock layers along the broken zone - the Paunsaugunt Fault. You can see some evidence of the fault from here - movement along it tilted the Sinking Ship - but it is easier to recognize from the road to Tropic.